MAM-A CD-R 80 Min. 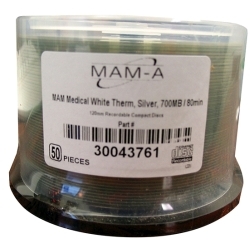 Medical White Thermal 50/SP (43761) : Disk-O-Tape, Inc.
MAM-A Medical CD-R & DVD discs have been trusted in the medical field for years. The inherent stability of MAM's patented Phthalocyanine dye means that MAM-A Medical discs last longer than conventional CD-R media. The 24 Kt. Gold and Pure Silver Medical discs are FDA Certified and PACS compatible. All the manufacturing and packaging of MAM Medical discs is done under cleanroom conditions. Every disc undergoes a 100% inspection before it can be shipped. MAM has rejected random sampling techniques as simply not stringent enough for medical applications. This is a guarantee to the user that each MAM Medical disc is the finest engineered media available. The thermal transfer printable discs feature MAM-A’s patented Diamond Coat™ technology for single color or Crystal Coat™ technology for full-color printing. 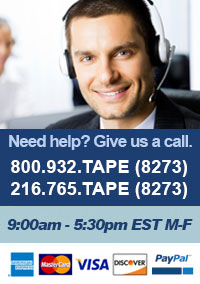 Both are engineered specifically to match the performance characteristics of all major thermal printers on the market.